Recently, Donald Trump was interviewed by Axios, and was asked whether he was truly bothered by the Saudi-led coalition using US bombs to kill civilians in the country of Yemen. In his reply, Trump called the attack a ‘horror show’ and said that bother’s not strong enough word. But additionally what he said was that the attack in August on a bus, in Yemen, was down to error in using the weapon. Trump elaborated that the attack in fact was the result of the bombers not knowing how to use the weapon properly. 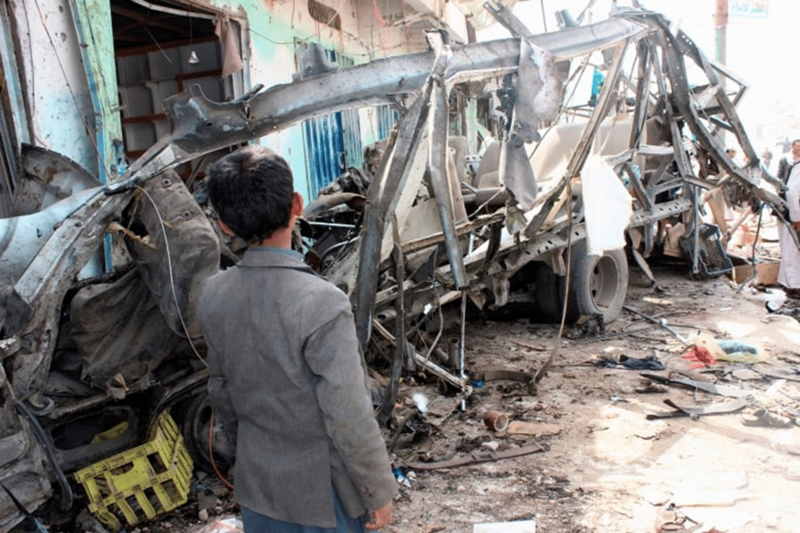 For those of you who don’t know about the matter, a bus was attacked in August, in Yemen, by using US bombs that killed at least 51 people, including 40 children with most of them being aged between six and eleven. The attack was carried out by Saudi-led coalition forces, fighting currently against the Iran-backed Houthis. Trump also said that the attack happened because people didn’t know how to use the weapon (US bomb), which is horrible. Further, he also told that he’ll be talking about a lot of things with the Saudis, but certainly he wouldn’t be having people that don’t know how to use the weapon shooting at buses with children. In September, the Saudi-led coalition in Yemen also admitted that the air attack on the bus was unjustified and pledged to hold anyone to account who contributed to the error. But this admission by the coalition came only after the mounting international pressure, even from the allies, to do more for limiting civilian casualties in the three-and-a-half-year civil war that has so far killed more than 10,000 people and pushed the already down-and-out country on the verge of a catastrophe. Meanwhile, the calls for western countries (including UK and US) to stop selling weapons to Saudi Arabia have increased heavily, especially since the death of journalist Jamal Khashoggi in Saudi consulate in Turkey, in October. After the death of Khashoggi, Trump had said that he didn’t want the US to lose its share of the huge Saudi arms market to Russia or China, since it brought them around $110 billion in the US.